From April 26-30, 2017, Saint John, NB will come alive with Atlantic Canada’s biggest celebration of music. 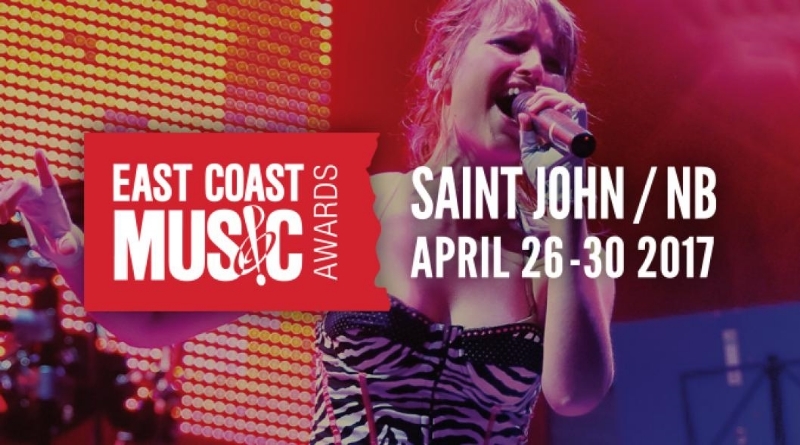 The East Coast Music Awards: Festival and Conference is an event like no other – get on the list as New Brunswick rocks out with thousands of cheering fans, musicians and industry reps! A wristband or pass is the best – and most affordable – way to experience the ECMAs. With over 500 musicians playing at over 50 events in five days, wristbands and passes allow you to hop from venue to venue to take in as much live music as possible. Experience showcases from your favourite East Coast musicians, and discover new artists to love. Many showcases and venues are subject to 19+ age restrictions. Individual showcase tickets will be available at the door – subject to capacity. THE 2017 EAST COAST MUSIC AWARDS SHOW happens Thursday April 27, 2017 at Harbour Station. Hosted by comedian James Mullinger, performers will be announced soon. Early Bird Awards Show Tickets are on sale for $35 plus fees. Get access to all 2017 ECMA stages at bars and clubs, and evening stages at the Saint John Trade & Convention Centre (subject to capacity) with a WRISTBAND (4 DAYS). Does not include access to the Awards Show, Songwriters’ Circle, Conference sessions, Export Buyers Stage performances, Industry Awards Party or the Big Ticket Show. A limited number of early bird passes available for $55 plus fees. All events are subject to venue capacity. A WEEKEND WARRIOR WRISTBAND (2 DAYS) will give you access to all the 2017 ECMA stages at bars and clubs and evening stages at the Saint John Trade & Convention Centre for Friday and Saturday only. The Weekend Warrior Wristband is now on sale for $45 plus fees. There are a limited number of early bird FESTIVAL & CONFERENCE PASSES available for $75 plus fees. Get priority access (ahead of wristbands) to all 2017 ECMA official stages (subject to capacity) as well as the International conference workshops, keynotes and showcases (subject to capacity, some events require advance registration) and access to the Industry Awards Party. Does not include access to the Awards Show, Songwriters’ Circle or the Big Ticket Show. All events are subject to venue capacity. There are VIP PASSES are on sale for $350 which will give you front of the line access to all 2017 ECMA stages; international conference workshops, keynotes and showcases (subject to capacity, some events require advance registration); admission to the Songwriters’ Circle; admission to the Industry Awards Party; and admission to the Awards Show. This does not include access to the Big Ticket Show (details TBA). All events are subject to venue capacity. Purchase tickets and passes while you still can! Click here to buy online. The post Get your ECMA 2017 Tickets & Passes Now appeared first on Giv’er Saint John.